The Ferment in a Kettle (FIAK) system allows you the homebrewer, to convert an ANVIL brewing kettle into a versatile, sanitary, stainless steel fermenter at a VERY low price. All-Grain brewer? Then convert your Hot Liquor Tank or Mash Tun into a fermenter after mashing, and be ready to fill right after the boil! If you're an extract brewer (or BIAB), simply rack your chilled wort to a sanitary bucket or another vessel after the boil, clean and sanitize your ANVIL kettle, then transfer the wort back. Simple as that! Perfect for: The occasional brewer (brews once a month or so) who wants to get the most out of their high-quality equipment purchases! This Ferment in a Kettle kit was designed specifically for use with the 7.5 Gallon ANVIL Brew Kettle. 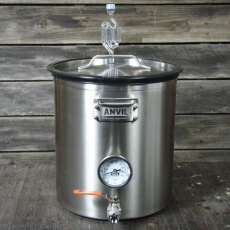 With this kit, you'll be able to ferment batches up to 6 gallons in your ANVIL Brew Kettle. Adds a silicone seal to the ANVIL kettle lid, thus creating the perfect seal needed for fermentation to keep oxygen and bacteria out. The system also includes a grommet and airlock to add to the lid. Replaces the standard "nut" for your ANVIL thermometer, and replaces it with stainless sanitary nut that covers the threads on your thermometer that could harbor bacteria and other nasties you don't want in your homebrew. Adds a small teflon washer to the ANVIL dip tube. 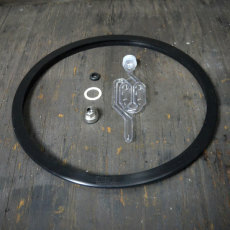 This allows you to rotate the valve and dip tube away from the yeast bed and act as a racking arm after fermentation is over, or for taking tasty samples during! 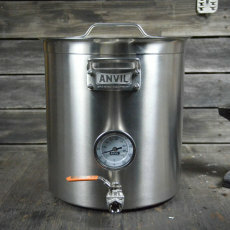 Turns your existing ANVIL brew kettle, into a high quality, sanitary, stainless steel fermenter. 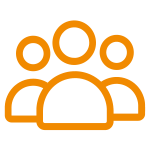 Allows you to save money by utilizing existing equipment! Patent pending one piece silicone lid seal fits tightly blocking oxygen and bacteria from your beer. Patent pending racking arm utilizes a teflon washer to allow your ANVIL valve and diptube to turn freely and become a racking arm! Transfer sediment free beer like the pros! Unlike other manufacturers who use rivets to install their handles, ANVIL uses stud welded handles to eliminate rivets and the bacteria they hide. 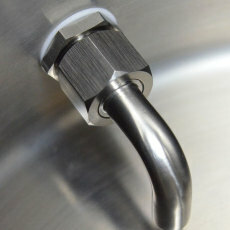 Unique sanitary nut covers the threads of the thermometer to provide a super sanitary thermometer connection with no exposed threads. All ANVIL kettles have pre-drilled holes to accommodate the included airlock and grommet- no modifications to the kettle necessary! You can never have too many fermentors right?!? Adding this kit to your Anvil kettle is easy and saves steps on Brew day. Works extremely well and my go to option for more aggressive fermentations.